Turmeric is an amazing support to your immune system. This antioxidant may also maintain cholesterol levels already in the normal range and so may also slow down the signs of normal aging. Turmeric has been recognized by yogis and ayurvedic healers since ancient times for its many healing properties. Grown mainly in India, the turmeric root is a close cousin to ginger root. It is dried and ground into a fine powder, brilliant gold in color, and used in many Indian recipes (this is what makes curry yellow). Commercially, turmeric is used for its color and as a thickener (yellow prepared mustard, canned soups, many processed foods contain turmeric!). Little do those food manufacturers know of this amazing root’s qualities! Sometimes referred to as the “poor man’s saffron” because of the golden color it imparts, the similarity ends there. Taken internally, turmeric is a friendly healer to the liver and stomach, promoting healthy mucus membranes and skin. Yogis know that it also helps with stiff or creaky joints and arthritis. It is also used as a digestive aid. There is also some evidence that it is even helpful in lowering cholesterol. Turmeric also has a drawing quality, to draw out toxins, dry up secretions, and to heal. Now, how to get that rather bitter tasting powder into your body? First of all, cook it. You can either boil it in water for 8-10 minutes to make Turmeric Paste or Golden Milk or sizzle in a little ghee or olive oil for 20-30 seconds. This takes out the bitter taste and also releases the essences of the turmeric into the oil or water. It must be cooked! Always accompany turmeric with ground black pepper as this will increase the amount your body absorbs by up to a thousand times. You can also get turmeric in capsules at the natural foods store. Usually the capsules contain a greater concentration of curcumin, its active ingredient. Sore Throat (especially with mucus/phlegm stuck in throat): Take about ½ teaspoon of thick turmeric paste and form into a ball. Pop it into the back of your throat and swallow with a glass of water. You can do this a few times a day or as often as every hour if desired. Creaky or Stiff Joints: Take at least 1 cup of Golden Milk every day for 40 days. Stomach & Digestive Problems: Golden Yogurt, a total of at least 1 cup a day. This is also good for intestinal candidiasis; the yogurt brings in the good bacteria for healthy intestinal flora and, since turmeric is a natural anti-fungal, it helps to counter the yeast overgrowth. About 15 years ago, during a very stressful time, I developed gastritis. Yogi Bhajan suggested I take a daily concoction of yogurt, banana and 1 Tbsp. of turmeric paste. I found this really quite helpful. Turmeric paste: You can add turmeric to so many foods. Keep a jar of turmeric paste in the fridge (it keeps for a couple of weeks) and add a spoonful to your breakfast cereal, smoothies, and even spread on toast with a little honey. Also, it’s easy to add a spoonful to cooking foods, such as rice, tofu, and vegetable dishes. Its benefits do not stop yet! Turmeric is used externally as well. Skin Conditions: The juice of fresh turmeric is prized as a cure/soother for many skin conditions, including eczema, chicken pox, shingles, poison oak/ivy, and scabies. Apply Turmeric paste directly to the affected area, cover lightly with gauze or loose cotton clothing (that will likely be ruined with stain). This is known to help dry the blisters up and accelerate the healing process. For shingles, one ayurvedic remedy calls for first spreading a light coating of mustard oil on the shingles rash, and then spreading the turmeric paste over that. (Skin condition such as those described above are seen in Ayurvedic and Chinese medicine as originating from liver congestion/toxicity. You can help your rash from the inside out, by also ingesting turmeric. Sores/Wounds: Keep turmeric in your first aid kit! It acts quickly to help stop bleeding, plus because of its anti-bacterial quality, will help prevent infection. For cuts, pile on the turmeric, cover with gauze, and apply pressure to the area to stop the bleeding. Of course, serious wounds require immediate medical attention. Douche: Made with fresh plain yogurt, turmeric and water, this is especially helpful in countering odor and yeast problems, and is the best douche to use following the menstrual period. Use 8-10 parts water, 1 part yogurt (be sure it has active acidophilus cultures), and 2-3 tsp. turmeric. Blend it up in the blender until smooth. Bring turmeric and water to a boil. Let it boil until it forms a thick paste. It must boil at least 8 minutes. If necessary, add more water. Once it starts to thicken slightly, you must stir it constantly to prevent scorching. Store in a glass jar (it will stain a plastic storage container) in the fridge. This article was originally posted by Amanda Mary Jewel in November 2014 for Mother Nature and You. 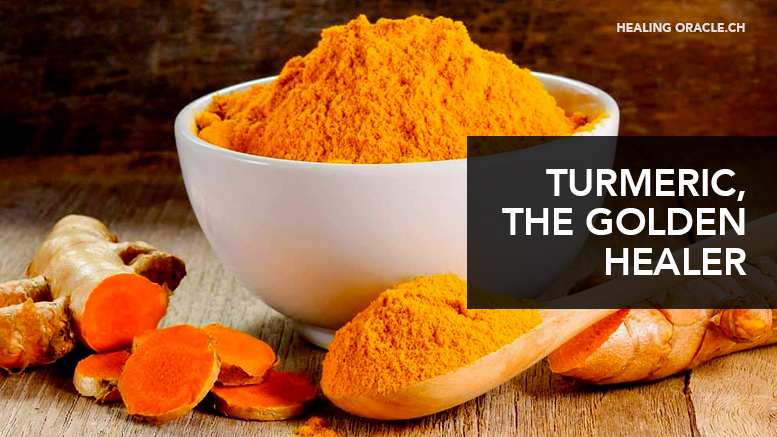 Be the first to comment on "TURMERIC, THE GOLDEN HEALER"